According to the theoretical study, hunting thresholds can be calculated for individual populations and species. The key to this is how quickly a population grows naturally, and how much it competes for resources. The researchers say previous models that explore the impact of extracting wild species—such as whales, bison, rhinos, birds and fish—do not take into account random environmental factors that could threaten animals at the same time. Published in the Journal of Mathematical Biology, the research was conducted by academics at Tufts University, Wayne State University, City, University of London and University of Hong Kong. 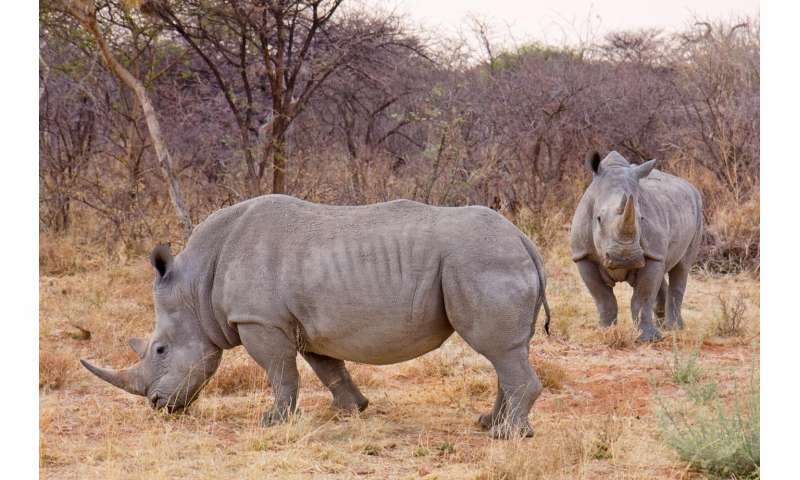 Dr. Sergiu Ungureanu, a Lecturer in Behavioural Economics at City, said: "The problem we found was that if numbers of a species become too small, not only does their usefulness to humans decrease, but there is also a chance that the entire species goes extinct. "This is because random fluctuations in the environment will affect the numbers of the species, on top of what people do. "In the past, the problem was tackled either without taking into account environmental chance, or by ignoring the possibility of extinction in the distant future. "We removed these two important limitations and we proved a simple result—there is always a population threshold under which there should be no harvesting." The researchers conclude that a "bang-bang" approach is the most effective strategy. This is where hunting is done at one of two fixed rates, like an on-off switch. It is argued that if humans can control animal populations better, harvesting can be more efficient and the risk of the population going extinct is lower. According to the study, populations that grow faster should be left to grow to a larger size, before hunting starting again at the pre-designated hunting rate. The researchers say that a faster growth rate means a higher, more efficient and sustainable rate of extraction can be maintained. When a population becomes endangered and it has a lower growth rate, the study shows, it should be left to grow bigger to avoid the risk that it will go extinct through other environmental threats. Dr. Ungureanu said: "The goal is to help ecologists understand the problem and its parameters, the variables of interest, and to give them tools to find the exact numbers they need for the optimal extraction strategy for any particular application." The researchers say they conducted the study because many wild species are at risk of being harvested to both local and global extinction, including whales, elephant seals, bison, rhinos, endangered birds, mammals and many species of fish. They explain this risk of extinction is increased because animal populations fluctuate randomly in time, due to environmental factors that cannot be predicted. As argued in the paper, the issue of chance is not taken into account in previous studies and it can lead to an overestimation of the ability of species to recover, potentially leading to extinction. However, the authors say a rate of harvesting that is too low also causes problems for a species as higher numbers will lead to higher competition for limited resources, which could also have a negative effect on their habitat. That sounds better than mass killing. I wonder how we think about that when our number comes up. These mathematicians need an education in speciesism and ethics. This study brought to you by the trophy club, Safari, International and Japan, Iceland and Denmark Whaling, International.